Volkmar Denner: "In view of vehicle buyers' uncertainties, the denigration of the diesel must stop." FRANKFURT -- Robert Bosch has felt the impact of the diesel-emissions crisis through its ties to Volkswagen Group. 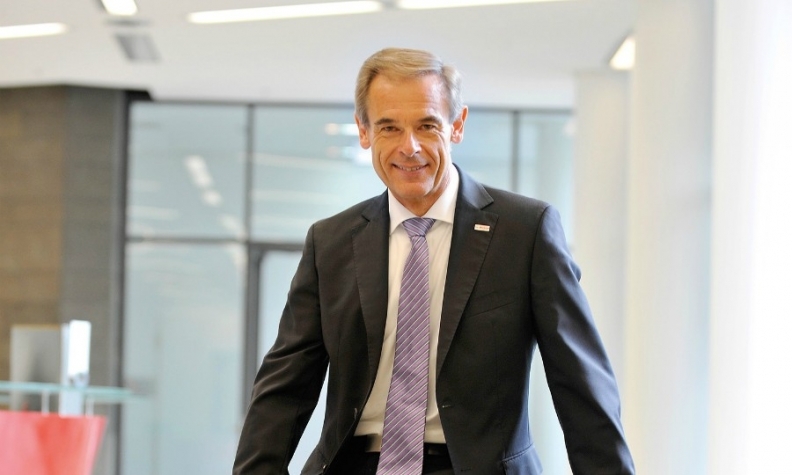 But the supplier has been able to offset any hit to sales through its strong commercial vehicle business, CEO Volkmar Denner told Automobilwoche, a sister publication of Automotive News Europe, in an interview. What impact did the diesel crisis in Europe have on Bosch? At present, we have a very good situation in our diesel business. In Germany and Europe, we certainly have a declining market. But we can more than compensate for this with the booming commercial vehicle business in China. We also know that the commercial vehicle business is subject to considerable fluctuations. If there were a decline, it would have an impact on employment at Bosch. In view of vehicle buyers' uncertainties, the denigration of the diesel must stop. You develop complete electric powertrains. Why doesn’t Bosch build the cars for them? That would put us in competition with our own customers. We are happy with our positioning as a supplier, and we are very successful in this role. We specialize in developing and building components that we sell to multiple customers and thus achieve the required economies of scale. We are not aiming for direct competition on the end product, the automobile. How long will you continue to invest in the development of internal combustion engines? That mostly depends on the automakers. At the end of the year, we are expecting proposals for new CO2 limits after 2020 at the European Union level. It is certain that they will continue to decline. That poses the question: What technologies will make it possible to reach these values. It is an illusion to think that this can be achieved without advanced diesel and gasoline engines. What role will plug-in hybrids play as a transitional technology? Bosch is putting a great deal of effort into research and development. When will the time come to focus on a few forward-looking technologies for powertrains? It would still be too early for an innovative leader such as Bosch to make that decision now and limit itself. We are looking at everything and are pursuing different paths. But it’s clear that we cannot do this forever. The economic risk is significantly greater for us as a supplier. Automakers are generally positioned in a modular fashion and can build various engines on one production line. With us, however, the components used in gasoline, diesel or electric powerplants vary greatly in terms of the machinery and production processes in use. As a result, suppliers need more time for the required adjustment processes than the automakers do. The Terra E consortium is planning a gigafactory for battery cell production in Germany or another European country. Does this have an impact on your plans? I’m relaxed about this. We are sticking to what we have announced. We are investing in research and development to explore the battery technology of the future. It is a key element for a decision on whether it makes sense to get into battery cell production. This involves billions in investments which Bosch could indeed finance. But the company wants to consider them carefully. The arguments for and against cell manufacturing is not merely valid for Bosch in particular. Our answer will be based on these criteria around year’s end. Daimler is involved with volocopters. Is Bosch also thinking about air taxis? Of course, I am familiar with the concepts. We’re also involved with aviation. For example, we make engine control systems for aircraft. It is clear that we have to completely rethink the mobility of the future and use modes of transportation differently. Some people say, “Let’s use the third dimension for that – meaning the airspace.” But if that means we are not going to change anything in the lower two dimensions, then that would be totally wrong. We have to solve the problem of today’s traffic situation first. Does Europe need an electronics trade fair like the CES? What the VDA [German auto industry association] is doing with New Mobility World is paying off. It is trying to avoid what happened in the U.S. where the electronic themes are based at the CES in Las Vegas while the ostensibly classic mobility themes are on display at the show in Detroit. Our goal is to showcase the new mobility themes and the classic automotive themes in parallel at the Frankfurt auto show. That’s why, right from the start, we actively committed ourselves to New Mobility World to find attractive partners and bring this mobility to life, on driving courses, for example.